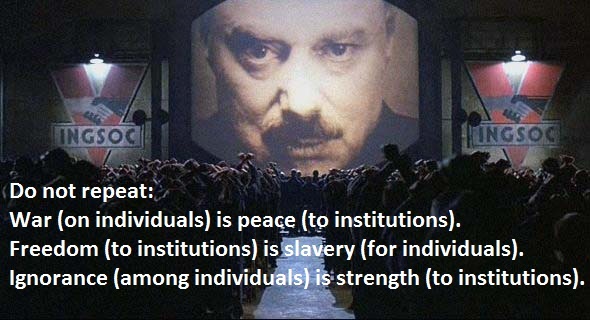 via (individual) Ignorance is Strength (to institutions). | Alternative. Your ignorance is their strength. Human history is the story of individuals and institutions. And today we are at the crossroads. Arguably all of the world’s most extreme problems stem from information and its lacking. Today there is a matrix formed at these crossroads, a figurative fork in the road where our story can be altered, where the direction will be chosen. We can submit to the information overlords or we can share information for all so that the entire globe can move forward. We can allow institutions to control information or we can open up and share information for all. Information is restricted from individuals and held by institutions so as to steer our thinking. Institutions seek to control information so as to control the direction of the population. The reason we all think the way we do is because of what we know and what we believe we know. For instance if the majority of individuals knew the detriment of war and nuclear experimentation no one would allow mad scientists and evildoers to perpetuate such ruinous turmoil. If the majority knew about the total environmental destruction that is taking place we would act to make a change. And yet information on relevant situations that directly affect us all is restricted so that we are steered to think a certain way or not think at all about certain things. Access to relevant information is being restricted by institutions. Alternatively institutions are compiling mostly irrelevant information on individuals. As the government and corporate oligarchical collectives of the world restrict information on their activities and the world’s actualities they are compiling information on individual activities. This information is basically useless and arbitrary information or would be, if it weren’t for the impetus to control everyone and everyone’s thinking. Relevant information should be open to all and the personal/irrelevant information should be irrelevant to institutions.